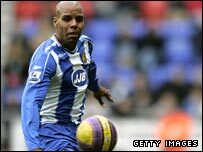 Hull City's bid to sign Wigan's Marlon King is being held up as King and his club sort out terms of his departure. The two clubs have agreed an undisclosed fee for the 28-year-old striker and Hull manager Phil Brown held talks with the player on Tuesday. "I like what I see and hear, but there's unfinished business at their end," he told BBC Radio Humberside. "So until that's done we can't move forward. Our business is done at our end, but it's not our decision." English-born Jamaica international King signed for Wigan from Watford in the January transfer window for around £5m and has made 15 appearances for the Premier League club, scoring one goal. Brown also confirmed last week that the club have bid a club record fee - in excess of £2m - for an as-yet-unnamed striker. But the player is not Manchester United's Frazier Campbell, who spent last season on loan with the Tigers. They are still hopeful of being able to bring the 20-year old back to the KC Stadium, although the player did play for United against Orlando Pirates on their pre-season tour of South Africa on Tuesday. Brown feels King would be a good partner for the youngster, if they can secure his services for another year. Meanwhile, the Premier League newcomers have also lodged bids for two central defenders - one of which is Bolton's Abdoulaye Meite. However, Brown has dismissed newspaper reports linking him with Noe Pamarot of Portsmouth.